Singapore: Prime Minister Narendra Modi today arrived in Singapore on the last leg of his three-nation tour during which he will hold talks with the country's top leadership and deliver a keynote address at the Shangri-La Dialogue. 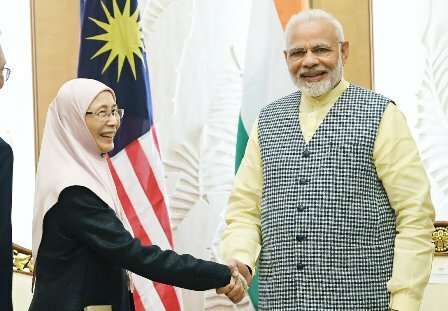 Modi arrived here after a brief halt in Malaysia where he met his newly-elected Malaysian counterpart Mahathir Mohammad and discussed ways to boost bilateral ties. An official welcome ceremony will be held in honour of Prime Minister Modi tomorrow, said the Ministry of Foreign Affairs here. Modi will hold talks with his Singapore counterpart Lee Hsien Loong and pay a courtesy visit to President Halimah Yacob. Prime Minister Lee will host an official lunch for Modi. Today, Lee and Modi will attend a business event on innovation and entrepreneurship at the Marina Bay Sands Convention Centre. Prime Minister Modi will deliver a keynote address at the 17th International Institute for Strategic Studies Shangri-La Dialogue on tomorrow. Modi will visit the Singapore Botanic Gardens where an orchid will be named in his honour. "Prime Minister Modi's visit reflects the close relations between Singapore and India and will build on the India-Singapore Strategic Partnership signed in 2015," said a foreign ministry statement.